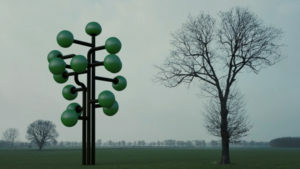 ‘The Expanding Tree’ is the visualisation of a concept, the 3D-animation of an idea. The artist might decide to make it an installation at a later date. 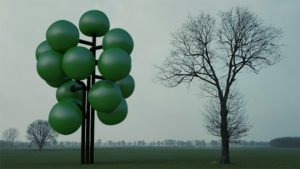 This 3D animation shows a pneumatic tree in nature. 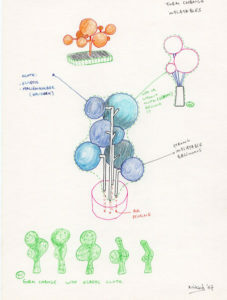 The tree consists of metal tubes (its trunk and branches) and of elastic and inflatable volumes (its foliage). The foliage is air driven: the volumes are gradually inflated and let down. In this way the fake tree imitates natural growth: from a naked tree to one full of leaves. Posted on April 17, 2018 at 6:29 am.